If you suffer from unbearably dry, uncomfortable skin, you might find your solution in Amlactin. This powerful moisturizer is chock-full of effective ingredients - and it just happens to do so much more than keep your skin soft! AmLactin may best be considered the heaviest heavy-duty moisturizer of the skincare world. The subject of accolades and praises galore, AmLactin was named the most recommended moisturizing product in an omnibus study of dry skin by the Dermatology Times in 2005. In 2007, Podiatry Management also rated it as such. Its moisturizing abilities are second to none. When applied, it restores hydration to dry skin and softens it for hours. It's rich in alpha-hydroxy acids (AHA), which are responsible for its ability to exfoliate dead skin cells. This reveals new, healthy skin and improves the appearance of dull, ashy skin. It's available in different formulas to suit different skin types. Despite its powerful performance, no prescription is necessary. This over-the-counter product is available at drugstores, grocery stores and pharmacies nationwide. It's affordable. Prescription products may cost a bundle without offering similar results, but AmLactin is recognized for making a visible difference -without the hefty price tag. The AmLactin lineup is broken down into two ranges - the original AmLactin and AmLactin XL. Both are formulated to target specific types of skin and conditions. Depending on your skin's unique needs and how it responds, you may prefer one over another. The lotion formula, packaged in a bottle, is extremely hydrating, yet is more lightweight than the cream. Use the lotion as an everyday treatment and to maintain smoothness. The cream, packaged in a tube, is richer and appropriate for individuals who experience exceptionally dry patches on a regular basis. Those who suffer from skin conditions, such as eczema and psoriasis, may also benefit from a thick cream. Both formulas are rich in 12 percent lactic acid, which is a naturally occurring AHA fermented from milk. It's used extensively in everything from moisturizers to cosmetics, and its ability to slough off dead skin cells and increase cellular turnover rates is unsurpassed. Though it may seem unusual to slather on a lotion that contains such a powerful AHA, it's this very ingredient that does such an impressive job of rejuvenating the skin and leaving it glowing. Individuals who suffer from skin problems like the aforementioned eczema and psoriasis, as well as keratosis pilaris and hyperkeratosis, report success when AmLactin is applied to trouble spots. The product eliminates the excess skin causing the problem and moisturizes it, all in one application. Skin that's truly rough and that does not seem to respond to typical treatments (including the original AmLactin) may benefit from AmLactin XL. This formulation contains the patented ULTRAPLEX, a highly potent blend of three AHA moisturizers: ammonium lactate, potassium lactate and sodium lactate. 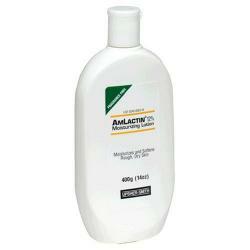 AmLactin XL is also thicker than the original lotion, and even richer than the original cream. As mentioned, individuals rely on AmLactin to stave off the unpleasant side effects of various skin conditions. One such condition is keratosis pilaris, which results in a buildup of keratin in hair follicle openings. The buildup results in red bumps that many people compare to goose bumps. They're often found on the upper arms, but may also appear on the legs, buttocks and even the face. It can feel rough and grainy to the touch, and though it's not harmful, it can be unattractive and make baring affected areas difficult. AmLactin is often used to treat keratosis pilaris, despite the fact that the condition has no known actual cure. The product's high content of AHAs is responsible for softening the keratin deposits that clog the hair follicles, in turn sloughing them off to reveal new skin. The fresh skin is instantly moisturized, resulting in less irritated, smoother skin.